What The Hell Is Brit Grit? America may well be the official home of pulp and noir but the United Kingdom, long perceived as the land of tame Dame Agatha style cozies and stuck-up, Latin quoting police detectives, also has a grubby underbelly which has produced plenty of gritty crime writing. And there is a new wave of Brit Grit writers leaving their bloodstained footprints across this septic isle, too. The godfathers of the new Brit Grit could well be Ted Lewis, Derek Raymond and Mark Timlin with Jake Arnott, J J Connolly, Ian Rankin and Val McDermid as part of the next wave. But in the last few years, more and more BRIT GRIT writers have been creeping out of the woodwork, through the cracks in the pavement, out of the dark and dingy alleyways. Scottish crime writer Tony Black, for example, is the author of four novels and a novella featuring punch drunk, booze addled Gus Dury, an ex journalist turned reluctant Private Investigator whose shoulder has more chips than Harry Ramsden. The books see Gus sniff around the back streets of Edinburgh and follow the rancid trail of crime and corruption right to to the top. They’re gruelling, intense and exciting journeys – not without moments of humour and tenderness. You may feel as if you’d like to give Gus a smack every few pages but the pit bull proves himself again and again. Gus Dury may be in the gutter but he’s still looking at the stars, albeit through the bottom of a bottle of whisky. And it’s down to Black’s great writing that when you you finish one of his novels you feel battered and bruised but can’t wait for the next round. Pulp mastermind Otto Penzler famously said that noir is about losers and not private investigators. Mr Penzler has probably never read any Tony Black – or fellow Scot Ray Banks, then. Banks’ Cal Inness quartet is the real deal. Inness is true loser. He’s a screw up. A lush. A mess. A man so far in denial he’s in the Suez. In each brilliant tale he bangs his head against as many brick walls as he can. And he feels the pain. And so do we. The quartet is as bitter and dark as an Irish coffee and leads to a shocking yet inevitable conclusion. And there’s more: There’s Alan Guthrie who gave us the best novel of 2009 with SLAMMER; Nick Quantrill ‘Broken Dreams’ which looks at a Northern English town that has had it’s fair shair of kickings but still isn’t out for the count; Bad Penny Blues is Cathi Unsworth’s ambitious look at the many facets of London in the late fifties and early sixies; Comic genius Charlie William’s and his nightclub bouncer hero Royston Blake help you see life in a way that Paulo Coelho never will! There’s Howard Linskey, Martin Stanley, Ben Cheetham, Christopher Black, Martyn Waites, Allen Miles, Danny Hogan, Chris Leek, Gary Dobbs, Gareth Spark, Sheila Quigley, Ian Ayris, UV Ray, Danny King, Col Bury, Mark Billingham, Andrew Bell, Alan Griffiths (whose blog is aptly called BRIT GRIT), Julie Lewthwaite, Steve Mosby, Darren Sant, McDroll, Richard Godwin, Colin Graham, Neil White, Andy Rivers . . . and more! There’s even comic BRIT GRIT from Donna Moore and Christopher Brookmyre, BRIT GRIT thrillers from Matt Hilton and surrealist BRIT GRIT from Jason Michel! And now, of course, we have True Brit Grit- A Charity Anthology edited by Luca Veste and me, with an introduction from Brit Grit mastermind Maxim Jakubowski. 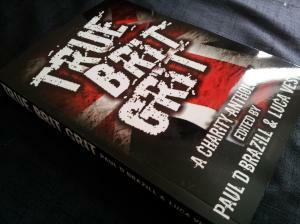 True Brit Grit is a hard-hitting, gritty, crime anthology from 45 British writers. All coming together to produce an anthology, benefiting two charities.